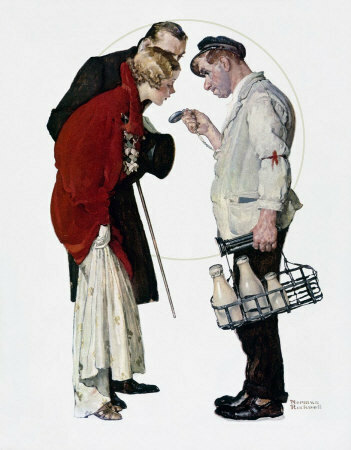 Couple With Milkman, a Norman Rockwell painting, appeared on the cover of The Saturday Evening Post published March 9, 1935. This is another favorite of Rockwell collectors, a classic enduring image of the world Rockwell painted. Am alternate title is Partygoers. This painting was Rockwell's 157th overall out of 322 total paintings that were published on the cover of the Saturday Evening Post. Rockwell's career with the Post spanned 47 years, from his first cover illustration, Boy With Baby Carriage in 1916 to his last, Portrait of John F. Kennedy, in 1963. This was also the second cover for The Post in 1935. In 1935, there were seven Norman Rockwell Saturday Evening Post covers published. The original oil on canvas painting, 27 x 30 inches or 68.5 x 76 cm, is part of the collection of the National Museum of American Illustration. on page 129 of Norman Rockwell, A Definitive Catalogue by Laurie Norton Moffatt. In this painting, Norman Rockwell shows us how a young couple stayed out way too late. This young couple has been having a wonterful time on their date. So wonderful of a time, in fact that they have stayed out until the crack of dawn. They have even run into a milkman finishing up his rounds. He only has two quarts and one pint left in his basket. We can assume that the new day has dawned. It looks as if the milkman's flashlight has been turned off. He is howing his pocketwatch to the lovers without shining a light on it. The milkman looks like he is upset with the couple. Couple With Milkman was only one of 322 Norman Rockwell Saturday Evening Post covers; Here is the list of Norman Rockwell Saturday Evening Post cover illustrations. He is probably annoyed that they have been out playing and galavating all over town while he has been working hard delivering the milk to his customers, who are themselves probably mostly still asleep in their beds. Ah well. At least he has the pleasure of knowing that they will both be miseraable at work today. They will both be exhausted. I bet they stay at home tonight! Do You Have A Great Story, Opinion Or Contribution About Couple With Milkman?